The last edition will be published Dec. 7. 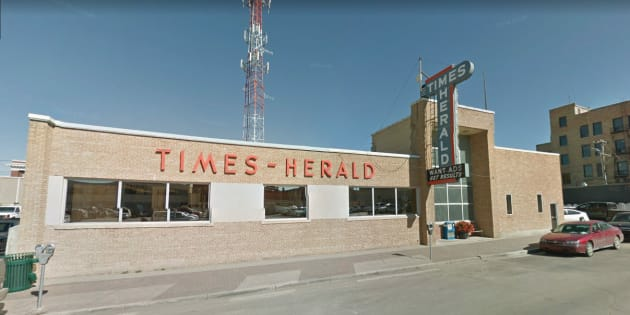 The Moose Jaw Times-Herald was founded as a weekly paper in 1889 and went daily in 1906. MOOSE JAW, Sask. — The Saskatchewan newspaper where former CBC radio host Peter Gzowski got his start in journalism is closing down after more than 125 years in the business. The last edition of the Moose Jaw Times-Herald is to be published Dec. 7. Roger Holmes, president of Star News Publishing Inc., says the newspaper's website will also be shut down. The 25 employees affected by the closure were informed Wednesday. "It's always difficult to make a decision that affects those employees and affects a newspaper that's been going in Moose Jaw since the 1800s, but economic conditions make it quite clear that it simply cannot continue the way that it has been continuing," he said in a telephone interview. Holmes said the Times-Herald couldn't withstand all the challenges facing small-town newspapers, including declining readership and increased costs. Star News Publishing owns several other community newspapers in Alberta and Saskatchewan. Holmes said those papers will continue to publish for now. The Times-Herald was founded as a weekly paper in 1889 and went daily in 1906. Holmes said Gzowski, who was host of CBC's "Morningside" radio program for 15 years got his first job at the newspaper. "It has a storied history," Holmes said. This is not going to be a funeral. It's going to be a celebration of a life. Its ownership has changed hands many times over the years. Holmes purchased the paper, which still published from Tuesday to Saturday, in 2016. There are plans to celebrate the newspaper's history and all it has brought to the community, Holmes said. "This is not going to be a funeral. It's going to be a celebration of a life."